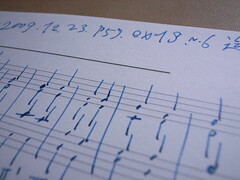 "For many musicians the idea of “transcribing” something can be intimidating. When I first started studying jazz seriously in college, I found the idea of writing something out that you learned off a recording a seemingly impossible task." You might wonder why you should bother learning to transcribe, after all there's a lot of tab out there in songbooks, tutorials and on the Internet. In my experience though there are always pieces I'd love to play that don't seem to have been tabbed, and the only way to learn to play those is to transcribe them (or find someone who will transcribe them for you). So, I've had a go at transcribing a few of these pieces, and I really know what Jason means by impossible task. There are just so many different things to take care of. Getting the notes right is hard enough in itself, but that's only part of the battle, you have to figure out rhythm and timing, note durations, and playing effects, as well as where to play all this on the guitar neck. So far almost all my attempts have ended in frustration and failure. Luckily for me, Jason's article has outlined a logical process that breaks down transcription into distinct steps that help to deal with all this complexity. The magic thing about it is that it actually makes the seemingly impossible task seem possible. I've had a go at applying it to a few short pieces as a test. Now, while I'm not saying I'm up to transcribing complete jazz solos yet, I have found that the process has helped me get further and feel more confident than my previous attempts. Looking for an easy way to create manuscript paper to try this process out? Try Staffnotes. Looking for free music slow-down software? Try Audacity. Here's a little update with some additional useful tips I found in this Guitar Noise post. I found the idea of drawing the shape of the line especially helpful. I'm kinda starting out doing this. I'm mentally committed (first time I'm telling anyone, so not REALLY committed) to doing the whole process for 1 song a month this year. Don't know if I'll go as far as staff, but maybe. Hi Dave, Sounds like a good goal. If it helps any feel free to drop by and update us on your progress - and any tips you pick up. Good luck with your transcribing. As it turns out, I have a slight problem. I'm OK with the notes. I get Every Good Boy Does Fine and with a little thought, I can get to 'three flats means E-flat', but I'm finding that the logic of quarter and eighth notes beyond me. Example: We had a big-time Nashville worship leader guy come up for a service. He has lead sheets. I listen to the MP3 and I hear three distict notes, and I see like seven dots. Any pointers about how to read the rhythm of staff? Hi Dave, a tough question there, I'm right with you on the difficulty of the rhythm stuff. I don't have a great solution for this yet (still working on it), but here are a couple of things I'm trying. - I think you have to get lots of practice at rhythmic dictation. A good way to get this is from a software training program - I use EarMaster Pro which has a built-in rhythmic trainer. There are plenty of other options if you Google "rhythm dictation exercises" for example. Dave, I just came across http://practicesightreading.com. Generates rhythm reading exercises for you.